Siemens Mobile division, over the past half-year of existence, has developed and released a number of products, at that the main aim, in order to maintain fading away sales, was copying a successful opponent. 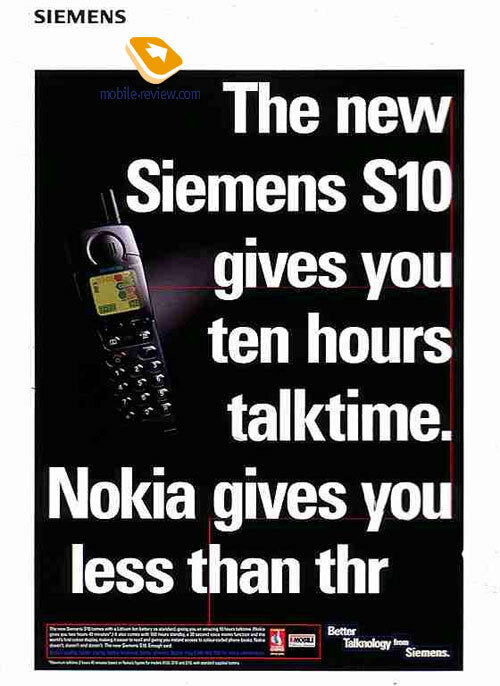 Though for this role, for some reasons the company chose Motorola – without hesitation, Siemens adopted the experience, provided by the already announced models and got down to developing its own analogues. 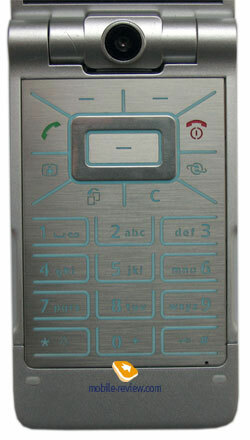 Thus Motorola SLVR L7 received a junior model in the appearance not of L6 handset, but of Siemens S68. 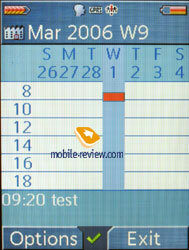 Model SXG75 copied one of the at long last cancelled Motorola’s models. 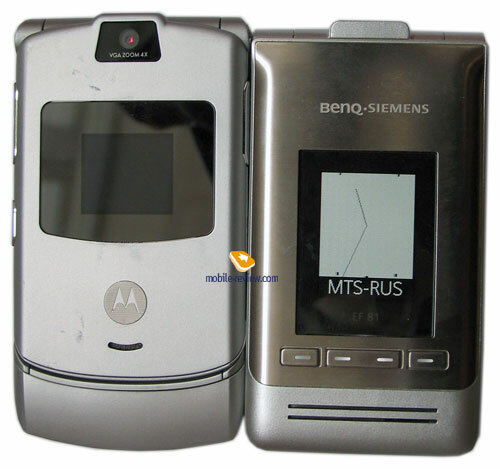 And now a device, aimed at the 3G networks, to be precise Motorola V3x, with a short delay, gets an analogue - BenQ Siemens EF81. 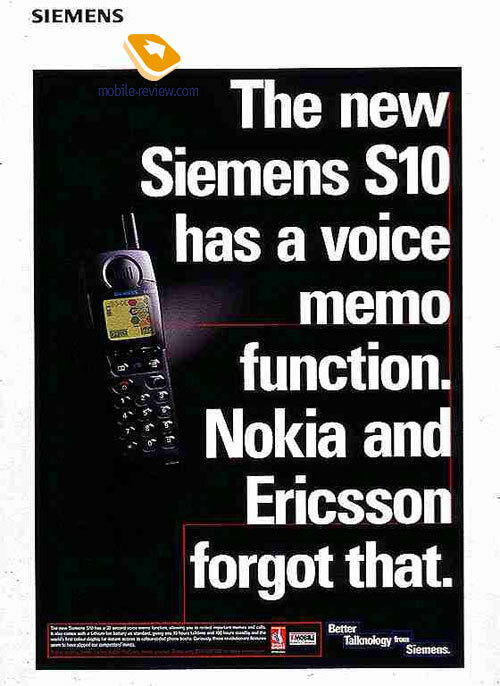 On one of the forums, visited mostly by fans of the taken up brand of Siemens, model EF81 was endowed with the following statement - «this is the slimmest device – Siemens managed to do something that Motorola could not materialize in V3x». And they are more likely to be correct, since it’s always easier to copy something rather than create a product of your own. Those companies, which use ideas of other, as a rule can’t release a device in time; therefore it obtains an appearance of a secondary product, though for undeveloped brands it’s a way up, another opportunity to consolidate their positions. Having known the technical specifications and capabilities of the competitor, one can overcome and improve them, slightly adjust price positioning – and that’s it, a recipe of stable, though not enormous sales. But the designers and developers at Siemens have sense humor for sure, as they decided to apply the theme of “Star Wars: Attack of the Clones” to the appearance of the device. 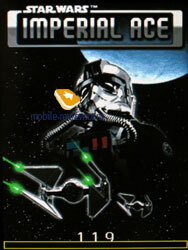 As to the clones – they do attack, actually, and we can make sure of that. 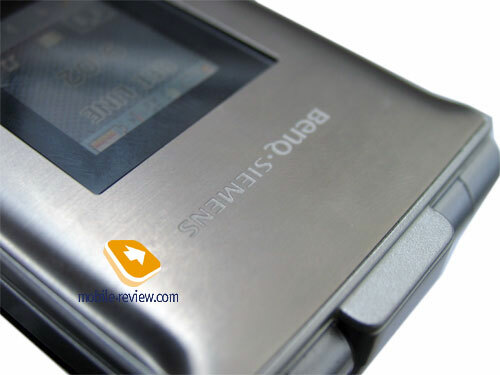 In terms of design, the clamshell by Siemens not at all reminds of Motorola’s products, saving for strap fastening – though its design has already been adopted from RAZR and is a standard de facto. The model’s appearance is quite fresh and is not trite, as it doesn’t look very slim when compared to Motorola RAZR, but still, Motorola V3x doesn’t seem to have vanishing depth. 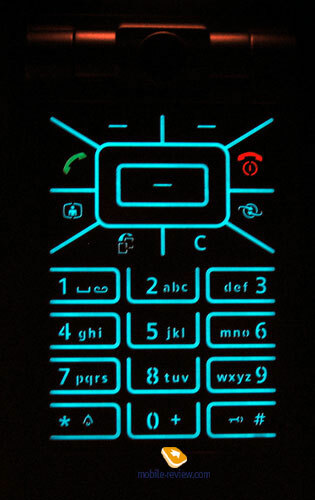 This impression is intensified by the handset’s width and a bit splayed, smooth corners. The best thing about this model is that the front panel is made of polished metal, so one can easily spot the texture – despite all other phones, the material, used here, is solid, you can touch it, feel even. 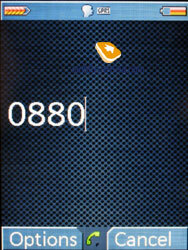 In this regard the device follows the route of Nokia 8800. 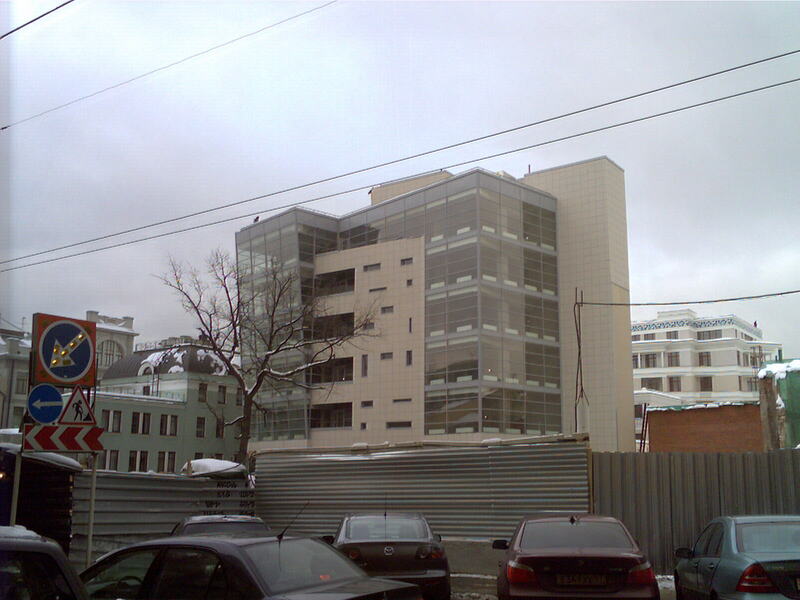 The main color of the shell is silvery, while the rear part is painted in black. It’s an unusual combination of colors, which creates certain contrast. 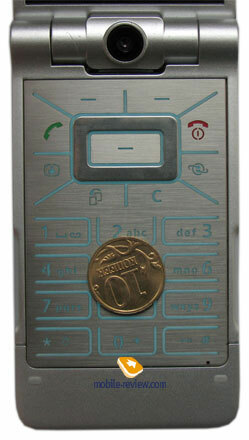 The rear of the handset is also made of metal, but here you deal with anodized aluminum. 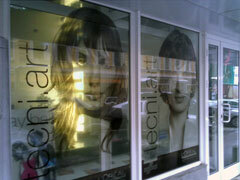 The applied materials leave the impression of good quality and reliability of the device. 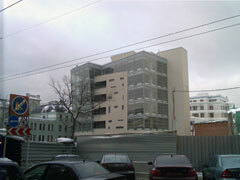 All parts are well-adjusted – one won’t spot any gaps in the construction, and is this worthy of respect. 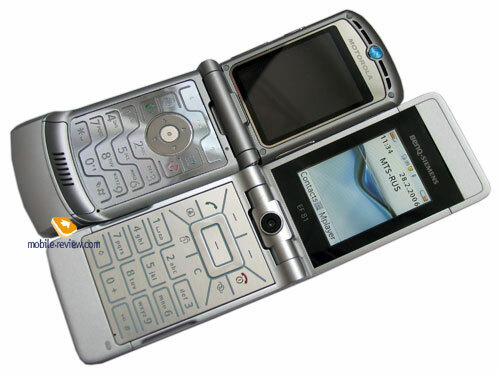 The battery’s cover is just one more occasion to make certain that all good ideas are worth their weight in gold – the design precisely copies the original RAZR solution, and it’s good to see when there are some standards which are observed. The only difference here is the cover’s tightness – on the one hand it’s not always in course of daily routine, but at the time this move provides absence of raspy parts. 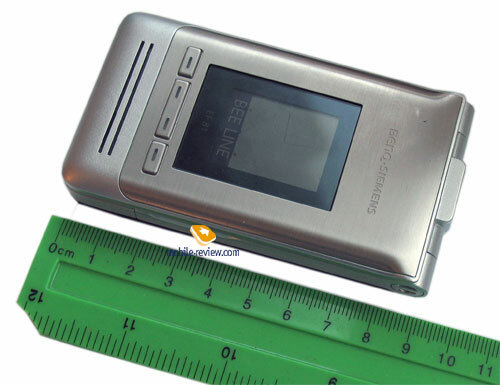 Measuring 94х51х16 mm, the handset is comfortable in terms of transporting it to any places you desire – it will easily fit pockets of both your shirt and trousers. 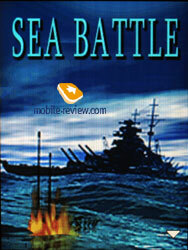 The weight of the handset is 110 grams, which meets the standards residing in this class of products. But the first incomprehensibility revealed itself in the form of lack of camera intended for video calls, since it’s a UMTS phone. 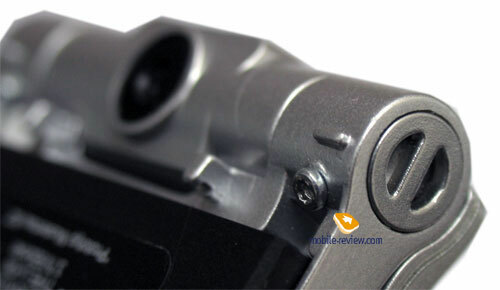 However its functions are redistributed to the standard one, which has quite uncommon design – the camera module provides 2 Mpix resolution with a built-in socket joint, which turns to you once you’ve opened the device. At that you can take pictures of the world, surrounding you only in closed condition, although it’s not as inconvenient, as it may seem at the first glance, but let us talk about this a bit later. 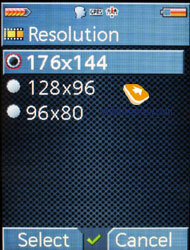 The front panel holds the internal TFT screen capable of displaying 262 K colors in 128x160 pixels resolutions. 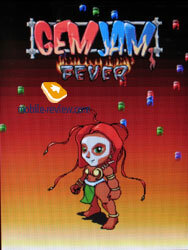 The screen itself is not bad, though I could doubt whether it really reflects 262K colors, but this would be a cavil. 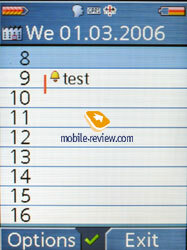 The display’s diagonal measures 1.25 inches, in other words 20x22 mm. The sun doesn’t cause fading effects, but the cover glass starts flashing and sometimes it causes certain impediments to reading information. 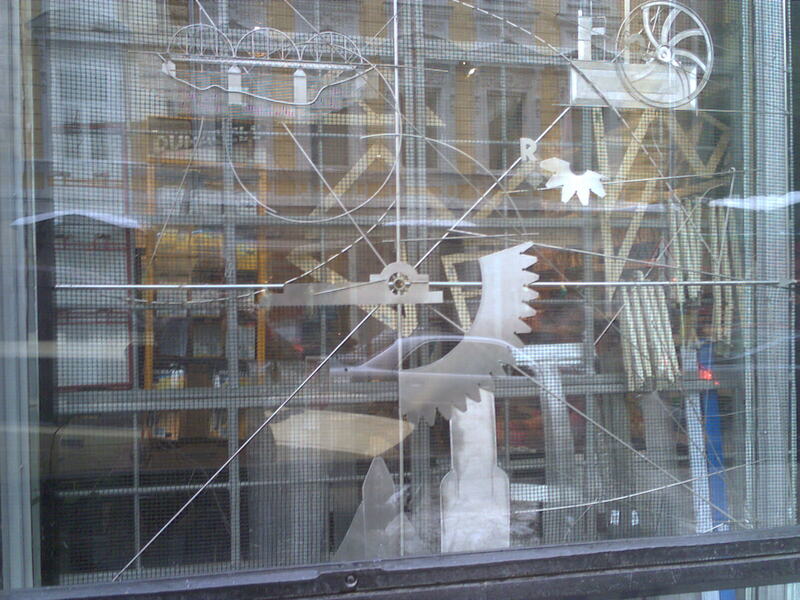 The glass is made of quartz, which guarantees steadiness against scratches. 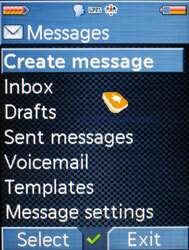 The screen constantly features information on battery’s charge, network signal, and reminders and displays digital watch. 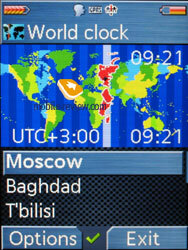 After a while of inactivity, the display becomes dim, and with the backlight turned off, the picture can be seen only in bright light – for these cases you can set a kind of screensaver, which will display the analog watch, looking pretty nice. 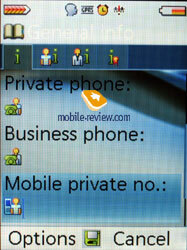 Under the screen one can find three keys, serving as control elements of functions, available when the handset is closed. The buttons are well-adjusted, don’t shift in their slots and are easy to push. 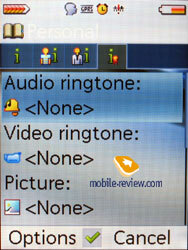 Other external keys, like side keys of volume adjustment, are not incorporated into the device. Finally, at the very bottom of the front panel you can find the loudspeaker’s apertures – its main function is playing back ring tones and work in the loudspeaker mode. This part of the device is realized on a very high level, as it readily reproduces music, but at the maximum volume level begins to crackle a bit. 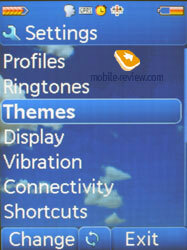 In fact it’s not a weakness at since, since this mode is applied only to ring tones. 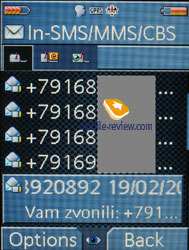 On both sides there are special hollows, which allow opening the device single handedly. However I’m at a loss whether these slots are not made well or my hands are not very precise – at any rate one can find the process of opening the phone a bit unhandy. 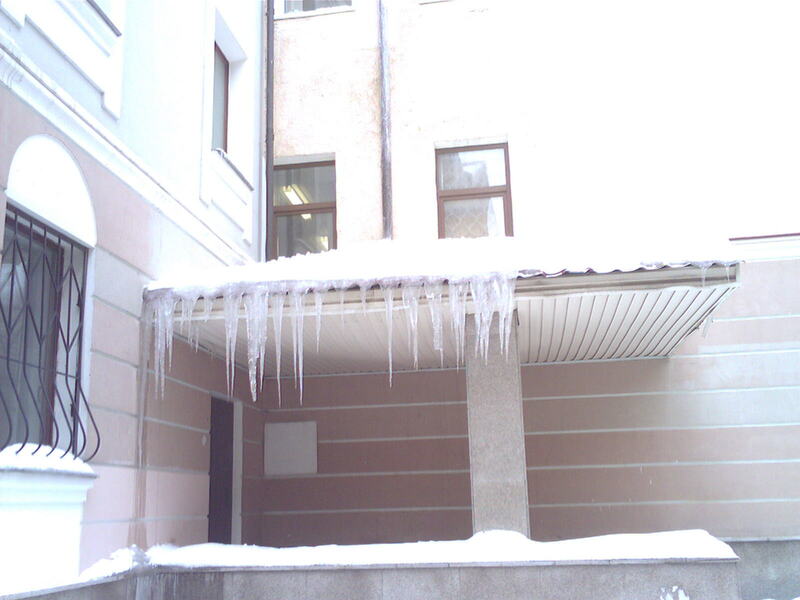 It’s possible, that this effect caused by uneven weight distribution between the halves. 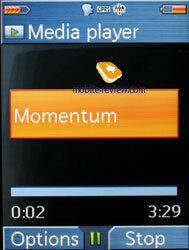 Having opened the device, you’ll see a very qualitative internal screen, which claims the position of the leader in its class at present and competes with Motorola V3x on equal terms. 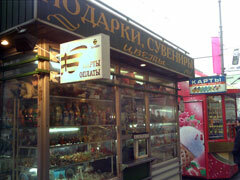 The display provides QVGA resolution (240х320 pixels, 34х45 mm, 2.2 inches) and is capable to display up to 262 K colors. 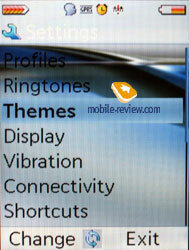 Due to the renewed interface and the main menu icons, the impression of the screen’s quality is only getting better. An at last Siemens heeded the request of many consumers and hired a professional artist, which managed to create really good-looking icons. It may sound impossible, but they changed general concept of childish pictures. How do you think, which brand the keyboard was adopted from? I’ll give you a hint – the first letter is M, the second one – O. I guess you have already guessed. Of course it’s always easier to use someone’s solution, rather invent something of your own. 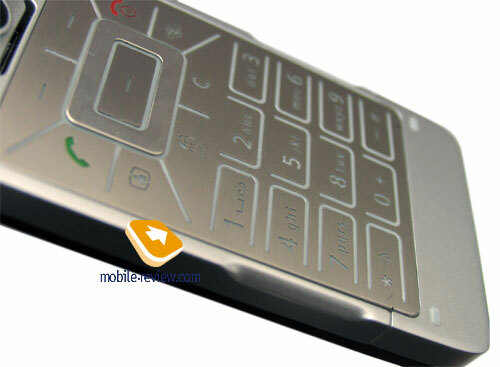 The keyboard itself follows RAZR style, even more, similar to V3x, the handset has rubber framings between the buttons, which make the performance of working blindfolded even higher. The navigation key is placed a bit higher than the keyboard, and to tell the truth not very handy due to its form and measurements. Under the keyboard one can find several rubber pads, preventing the screen from contacting with the buttons, however the framings themselves leave a lot of traces on the upper part of the display. 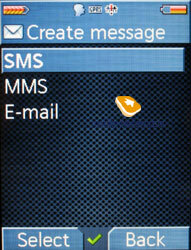 The backlight of the keyboard, as you can easily guess, is blue, since the same color is used by RAZR. The microphone is placed at the bottom of keys’ set to the right. The bottom part lacks any jacks, but the interface connector, which was changed once again – as its new title of “Nano” implements, now it’s really thin. Accordingly, the accessories from the previous models won’t work with this model. 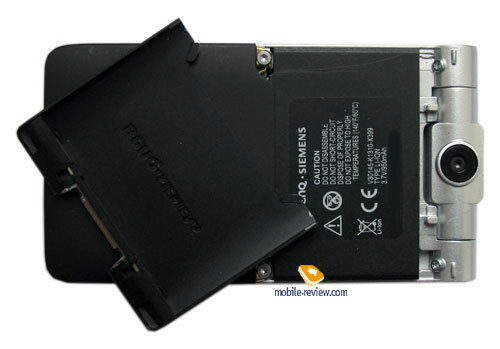 Having taken the back cover away, you will find a battery, which is actually a Li-ion accumulator with the capacity of 950 mAh. According to the manufacturer’s statement, the device can work up to 300 hours in stand-by mode and provide nearly 4.5 hours of talk time. 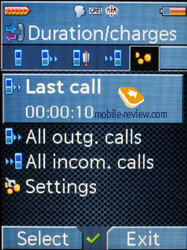 When using the handset in a common manner – talking about 1 hour in sum, performing other additional functions for 40 minutes – the charge lasts for approximately 2 days. Full recharge time of the device is around 2 hours. 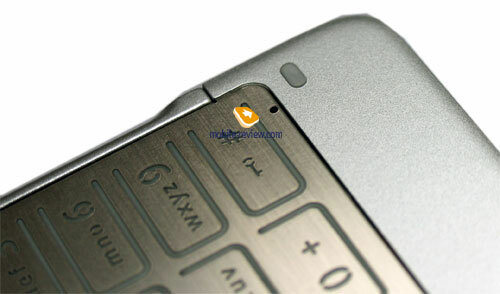 Under the batter one can find two slots, incorporated into the upper part of the shell – these are jacks for a SIM and microSD card. As you see, the device doesn’t let you carry out hot swap and this is a major weakness. A SIM-card should you pushed into the slot unless you hear a click, and in order to extract it, you need to press on the card. 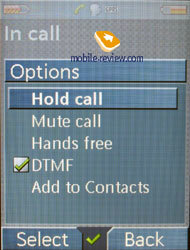 This handset is one of the first models, with an interface, aimed at operating both in open and closed conditions. It’s clear, that in order to take a picture of the surrounding world with the help of the built-in camera, you need to close the device. 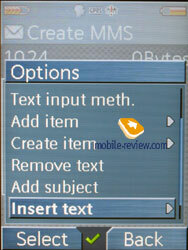 In order to start shooting, you just need to press the left key residing under the screen and call up the navigation bar, which features Camera as the first item on the list, Video recording – as the second, and these two are followed by Media Player section. To switch between these option use the doubled button. The button to the right holds the function of key lock, which may come in handy. 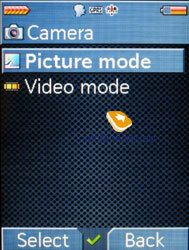 When bringing up Camera mode, you will be shown an animated picture, offering you to turn the device horizontally – the shooting can be performed in this way, when you hold the handset single handedly. 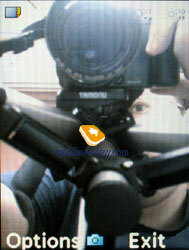 The process of camera execution is quite slow, and takes up to 3-4 seconds. 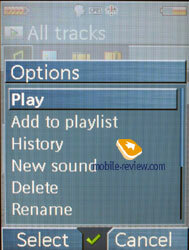 In case you run the media player, the device will display files list, playlists and recently played back tracks on the external screen – it’s quite handy, since there is no need in opening the phone in order to switch to favorite songs. When the phone is in playback mode, the middle key adjusts volume. On the whole, the process of working with the closed device leaves a favorable impression. 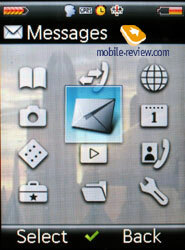 The interface has a smooth appearance owing to the all-new icons, featured on the main menu, well-selected gamma, and the pictures, which don’t seem as childish anymore as in the junior models. 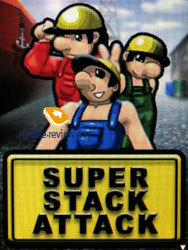 The main menu is designed as a 3x4 grid with fast number navigation function available. 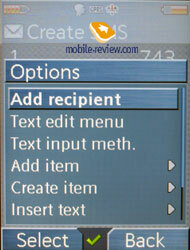 By tradition, there is an option for creating a My Menu item on your own by adding any desirable function to it. 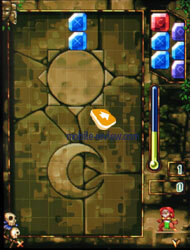 Tabs are in common practice in items on the menu, which you can switch by pressing the joystick horizontally between. 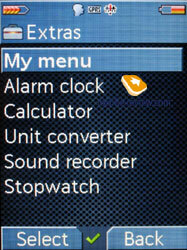 In terms of software, this model is an exact copy of Siemens SXG75 – all parameters coincide here, with the exception for the menu’s appearance, pre-installed themes and ring tones. 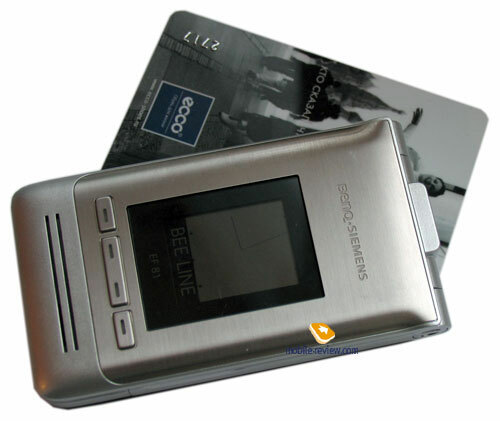 The device features 64 Mb of internal memory. Phonebook. 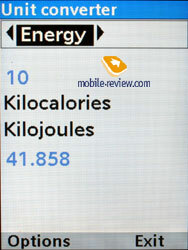 The phonebook is capable of storing up to 500 entries. For each contact you can submit four telephone numbers, two fax numbers, for e-mail addresses, two page URLs, company’s name, etc. 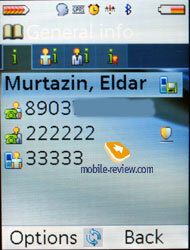 At that the phone numbers are displayed in a separate window, while fax numbers are located in private and business tabs. 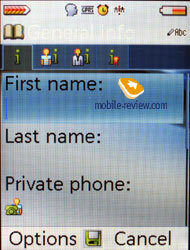 At the beginning of the general list the phone shows entries on English language, and after these – all contacts with the title names on all other languages. 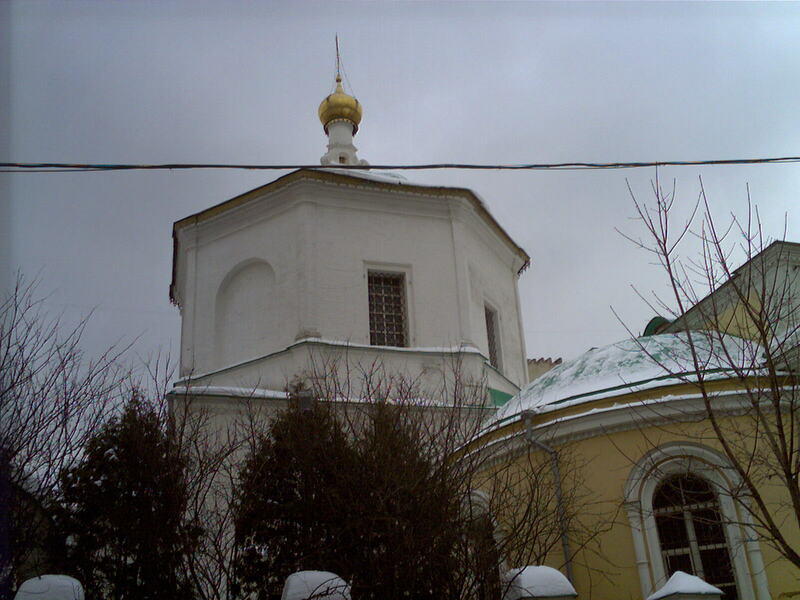 Each contact may be tied to a nickname, though in this case its place in the list will depend on the language, the main name of the contact was written on – so an English nickname may end up in the part containing only Russian entries. 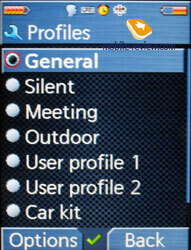 Among personal settings for each contact, one can set a particular ring tone, image, group, and birthday date. 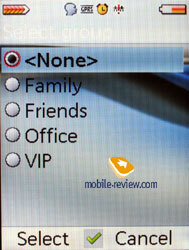 All contacts, stored in SIM-card may be viewed via a separated item on the menu. 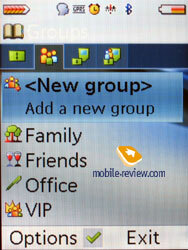 On default there are only four groups available, though the number of new ones is unlimited. 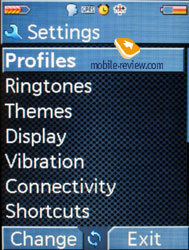 Each group can be bound up with a ring tone or image. 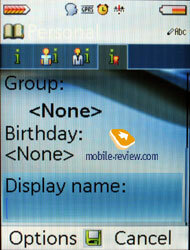 All contacts may be sorted by e-mail, page URL, birthday or by mailing list, even more, all sorted entries are displayed in a separate window. 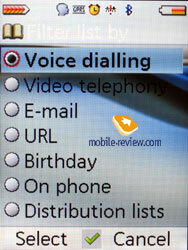 In order to make a call, you can use voice commands, available in this handset. 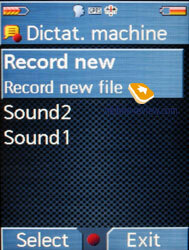 The device offers the capability of recording up to 100 voice labels, at that you can have several commands assigned to one contact. 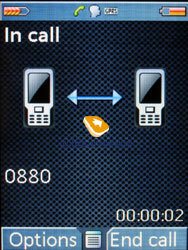 Calling up a voice label is carried out in the stand-by mode by pressing the navigation key up and holding it. One of the disadvantages of this function is that one can’t set various filters for particular group – the last used filter is always applied to all groups. Call List. 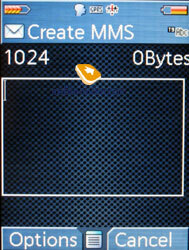 Up to 100 entries are stored in the memory of each call type – incoming, outgoing and missed. 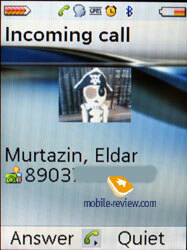 All calls are shown in common list too, with special icons for easier understanding. For each record you can see detailed information (date and time). 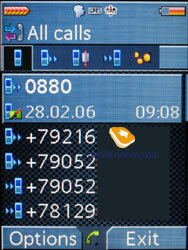 Traditionally here you can find settings for call costs and time limitations, this requires entering PIN-code. Internet. 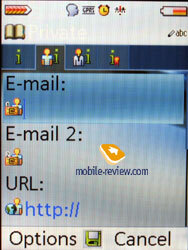 The phone has WEB-browser which supports HTML protocol. In case with English pages it’s almost okay, meanwhile Russian encoding causes significant problems. Camera. 2mpx camera with CMOS-module allows taking photos with maximal resolution of 1600x1200 pixels (other modes: 1280x960, 640x480, 320x240 pixels). 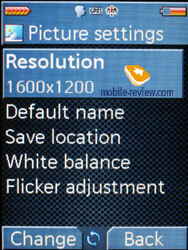 Other settings are: white balance (auto, indoors, outdoors), refresh rate optimization (50 and 60hz), file saving path. Autofocus is missing. 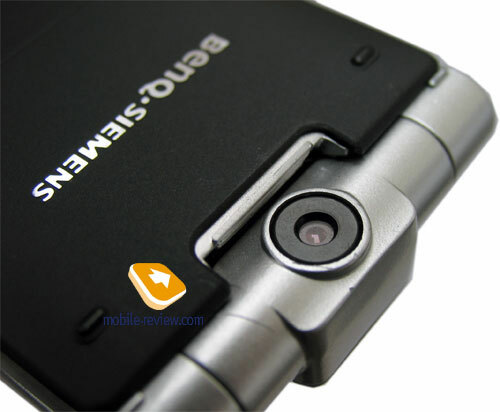 Camera’s specialty is presence of rotating mechanism, main shooting mode will be when the phone is closed, that’s about it. In case you open the phone, you will be able to take a picture of yourself, it will not be common for many, but because of external screen’s high resolution using the camera turns out quite convenient. Main idea is minimalism in all settings, just find an object, press the button and get your photo. 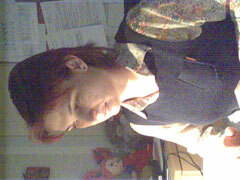 Traditional noise and color artifacts are encountered when photos are taken with bad lighting conditions, although photos of lightened objects made during night look good. 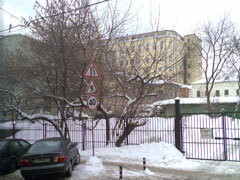 In case with maximal zoom (digital, up to 5x) image becomes blurry, this is peculiarity of digital zoom’s algorithm. However photos taken during artificial lighting conditions look surprisingly good. One of camera’s major drawbacks is lack of macro mode. 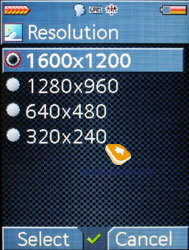 The time for saving photo in maximal resolution is around 3-4 seconds, this is rather much. Shutter’s sound cannot be disabled in any of the available profiles. 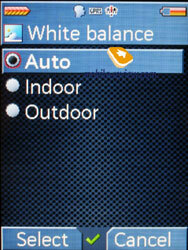 When the phone is opened, you can setup white balance (automatic, indoors, outdoors) and brightness level (from -3 to +3). The camera can record video clips in following resolutions 176x144, 128x96 и 96x80 pixels. 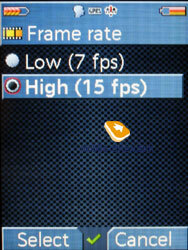 Frame rate can be adjusted (7 or 15 fps). Maximal recording time is 5 minutes. 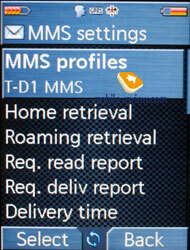 In case MMS mode is used, clip’s length is 10 seconds. 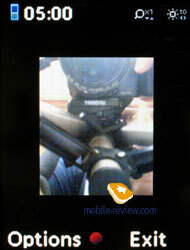 Digital zoom is not working during video recording. 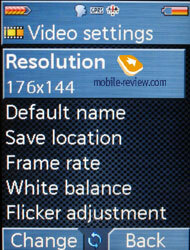 Video recording quality is not high. 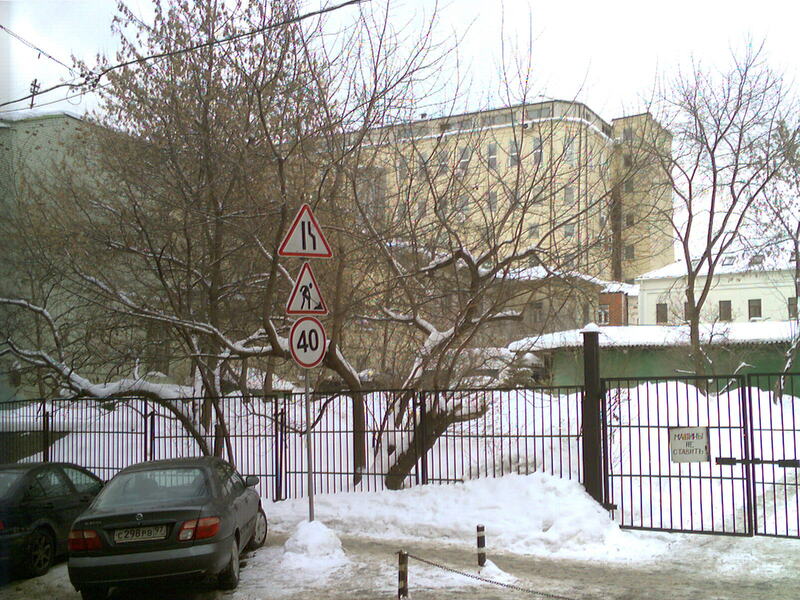 In case you are viewing the clip in its native resolution – the picture looks fine, but whenever you are trying to zoom it in, the picture becomes blurry. 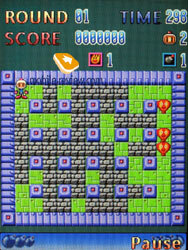 Several image fragments can be dropped out in case the object is moving fast. 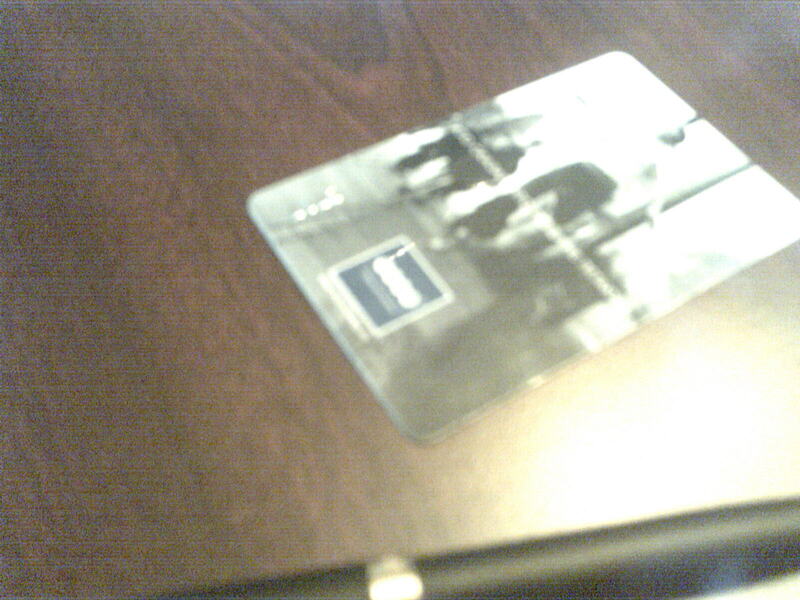 The impressions from built-in camera are quite predictable. 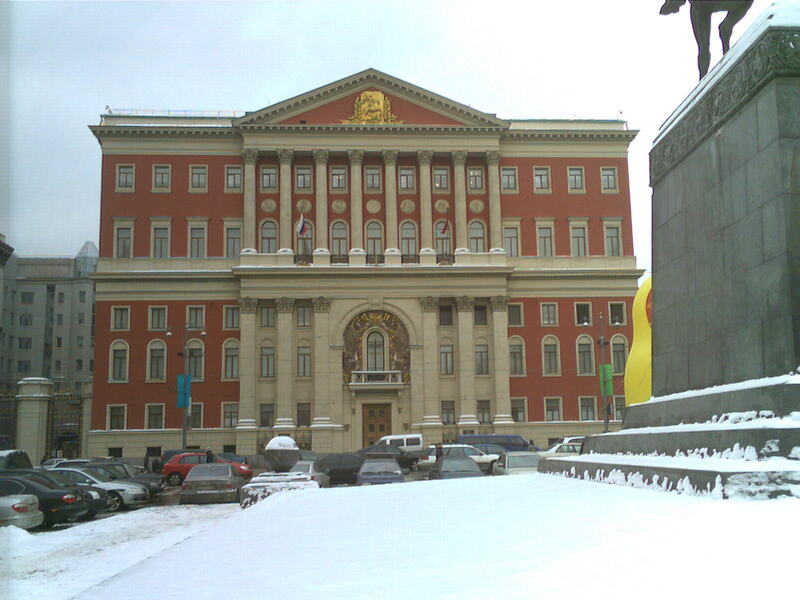 The photos are not any sort special, color gamma is moved towards blue area, the image looks colder than it is. When using digital zoom you can perfectly see its drawbacks. However for a product like this one camera is not the most important aspect it is sort of an addition. 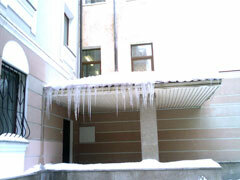 The camera’s quality is equal to the one installed in Siemens SXG75. Messages. 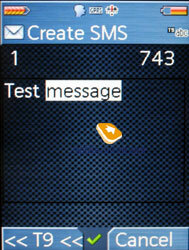 Three types of messages can be created – SMS, MMS and E-mail. 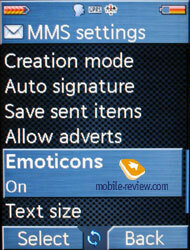 When you are creating SMS messages, you can type long compositions since joined message system is supported, maximal length is 755 symbols of latin font and up to 330 for cyrilics. 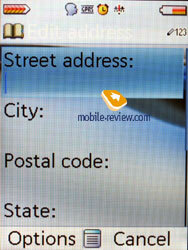 Extended modes are not supported, you can only insert text template or contact from the phone book. 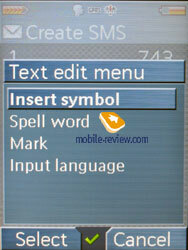 T9 dictionary without word automatch function is supported. The words that are not present in the database can be saved afterwards. Next time they will be used, and basically they get easily recognized. Traditionally, this phone supports text line the letters for the button you are pressing, however another tradition was kept as well, Russian letters do not match the common layout for most phones. 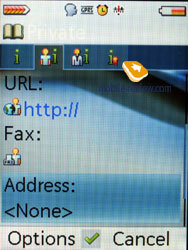 A profile must be created before composing email; otherwise this section will not open. 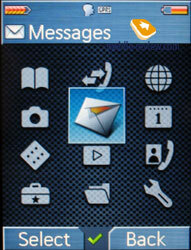 The email client supports SMTP, POP3, IMAP4 protocols. 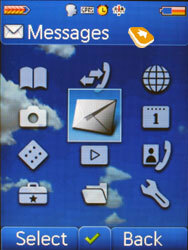 Any file (even those that are not supported by the phone) can be used as attachments. Maximal attachment size should not exceed 10mb. 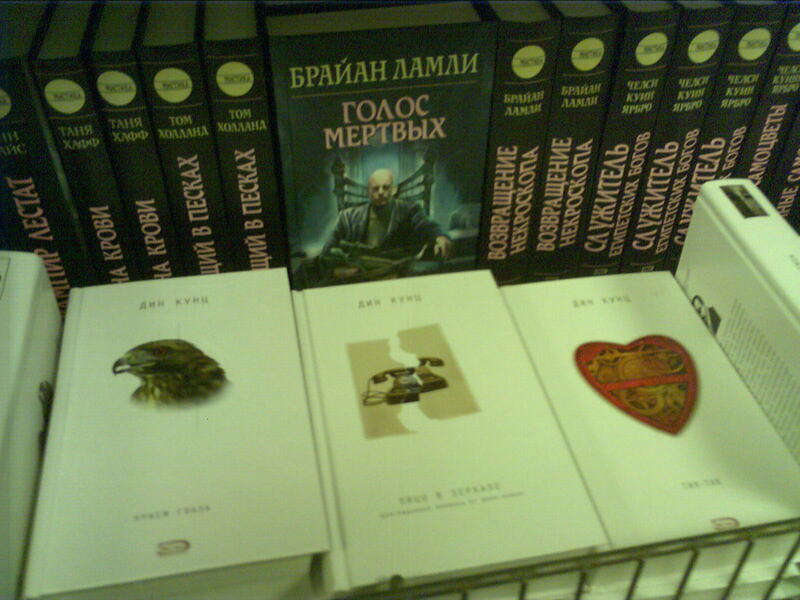 Russian encodings are not supported correctly. The only limitation for storing emails is phone’s available memory, that’s right you got it, memory card’s memory is not used by any means. 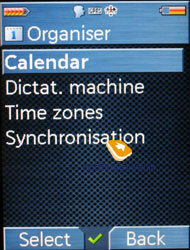 Organizer consists of calendar, voice memos, world time settings and synchronization point. Calendar’s organization is very good. Every new occasion is not related to any type. 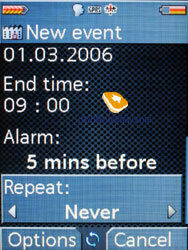 Each record consists of date, start/end time, alarm time (if required). Next you are free to select reoccurrence of the event (daily, weekly, monthly, yearly, never). Such way of organization reminds of some sort of advanced alarm clock. The only disadvantage of this idea is lack of ability to select certain days when the alarm is not required (for example – for weekends). Although this “problem” has a solution. You just have to set reminder separately for Saturday and Sunday, and later on set it to weekly repeat. 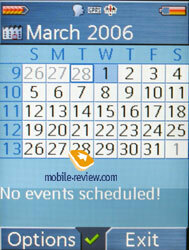 The events in calendar can be viewed monthly, weekly and daily. 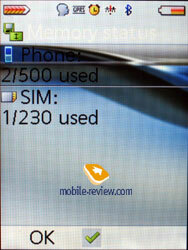 The number of entries is limited only by phone’s available memory. Dictaphone, basically this is used for voice memos. 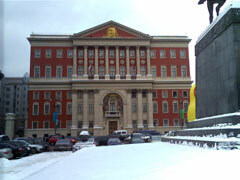 Overall length of one record is around 150 hours. Considering maximal possible battery life this is more than enough. 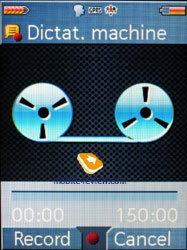 The Dictaphone can be activated during phone call. World Time function is pretty common. You can view the difference between two selected cities. 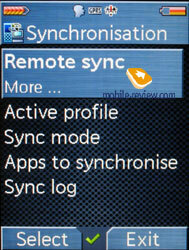 In Synchronization menu you can setup profile for wireless sync, select applications, setup profile and type of data exchange. You can also use external servers to store contacts and calendar events (SyncML protocol). 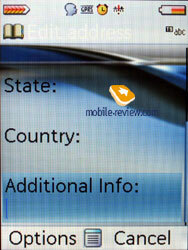 There are no problems with synchronizing with dedicated web-site. Games. 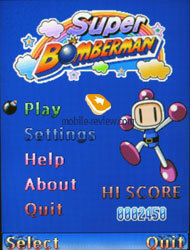 The phone has 5 preinstalled games - «Sea Battle», «GemJam Fever», «Super Bomberman», “Star Wars” and «Space Stack Attack». The games launch pretty quick, initial loading takes around 10-15 seconds. 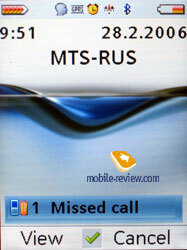 When an incoming call is received, games get minimized, and can be easily resumed afterwards. The same can be said about other Java applications, they all work fine. 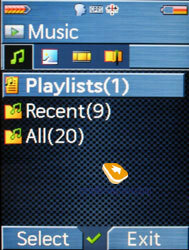 Mediaplayer. 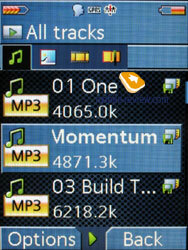 Media player is brought up as separate menu item, it even has its own icon. 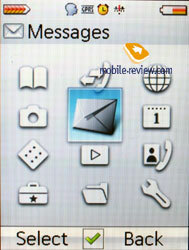 Just like in S75, this phone has multimedia processor Imageon 2182 from ATI built-in. 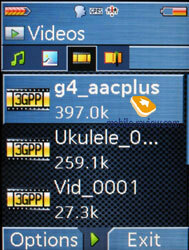 Alongside with traditional media files (ring tones, aac, mp3, 3gps, graphics, etc) the phone can playback video in Real Media 8/9 format. 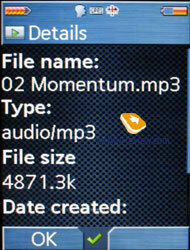 Media files can be viewed in full screen mode. 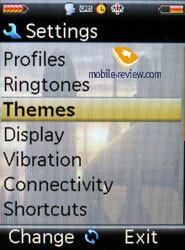 Playlists that can include up to 25 files are supported, media player can work in minimized mode too. You can view graphic files in slide show mode. One of the disadvantages of Media Player is lack of ability to select certain folder that will be used, I mean you cannot listen to one desired album. 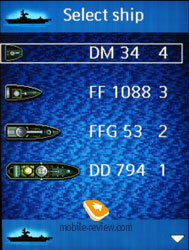 Such simple function as Shuffle is missing too, this makes player’s overall impression lower. 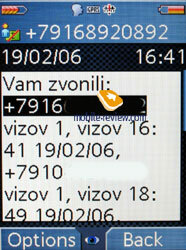 During incoming call current song gets paused, later on you have to either confirm playback or stop it. This is extremely inconvenient, and there’s no logics for this solution. Equalizers are missing, just like SFX, there is only one type of outgoing sound, and that’s it. As to volume, there are 10 levels, in case with headphones, 7th and 8th positions are most comfort ones. Like I said, the player can work in minimized mode. 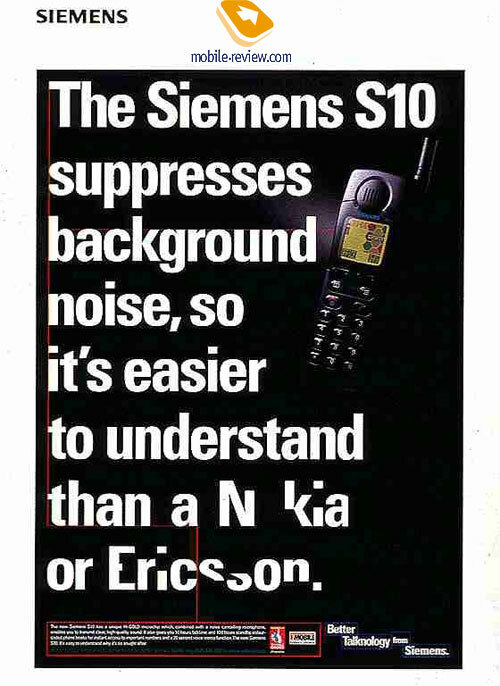 Those who are looking for music solutions from their headset should exclude Siemens products from their wish-lists, these handsets are missing all additional features besides simple music playback, they are rather ascetic. 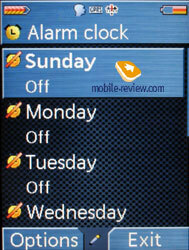 Alarm clock Alarm clock’s peculiarity is ability to install custom single ring tone for every week day. 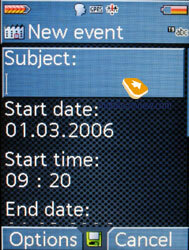 Calendar can be used in order to create other reminders. 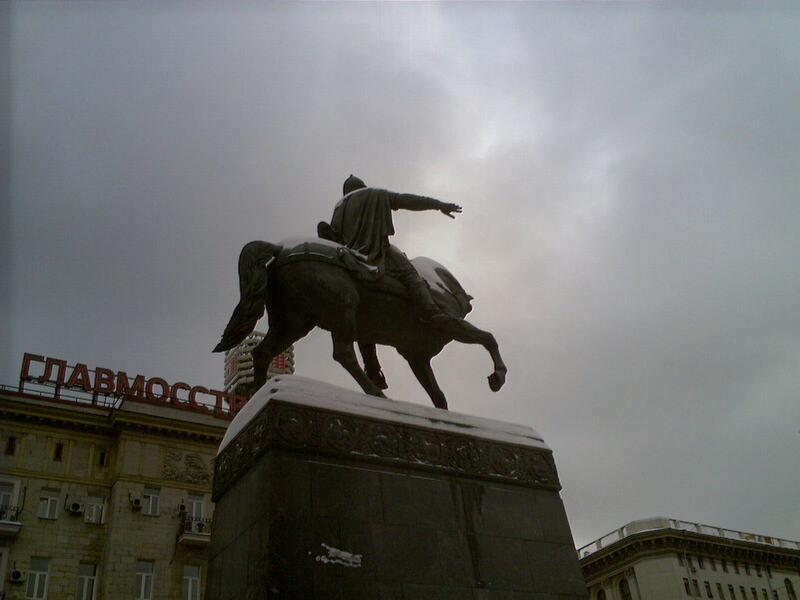 Sound Recording – the very same and already described Dictaphone. 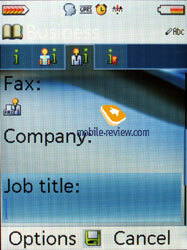 Traditional File Manager from Siemens. 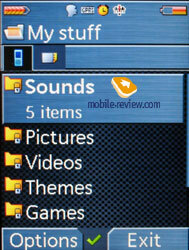 Besides simple folders with graphics, video and themes/sounds, folder with games and applications is displayed here as well. 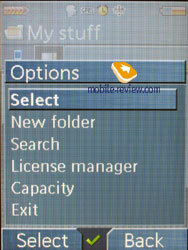 In other menu items applications are not displayed. 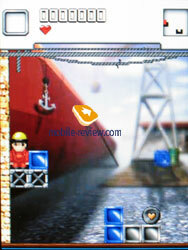 One of the installed applications are: “Photo Editor and “Rescue Dictionary”. «Photo Editor» is rather advanced software among other graphic editors for mobile phones. However this is clearly specific activity which takes a lot of time. In case it’s really necessary, it is easier and faster to edit the photo on desktop PC. The dictionary will be in demand for sure, it allows getting translations to one of the most commonly used phrases in 6 languages. There’s ability to add your own custom phrases into separate private database. 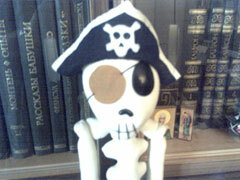 But you will have to add the phrase, its meaning in required language. The dictionary is unable to do it by itself, automatically. Settings. There aren’t any significant differences comparing to S75 or SXG75, except for vibrating alert settings. Attendant images were removed from this option. 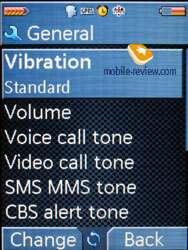 Profile settings with various vibrating alert types is present. 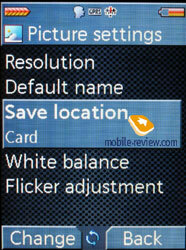 In Bluetooth settings you can choose memory card as path for saving incoming files. 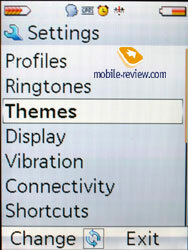 There are only five preinstalled themes, but they are rather interesting. Performance. 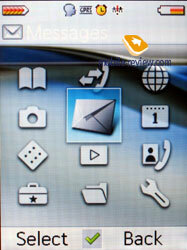 The phone’s performance is equal to SXG75, the difference is insignificant and depends only on firmware version. 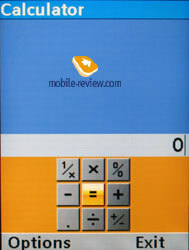 Unlike Siemens S75 and other x75 series models, this phone works faster. There aren’t any other differences or peculiarities. The phone hasn’t got any problems with network reception, the ring tone is clearly heard in various conditions, polyphonic ring tones don’t matter since you can use mp3 files. 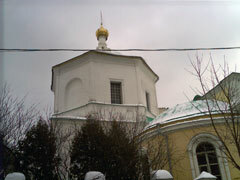 Noise, rattling is encountered only when the selected ring tone is not very suitable and the phone is located indoors. 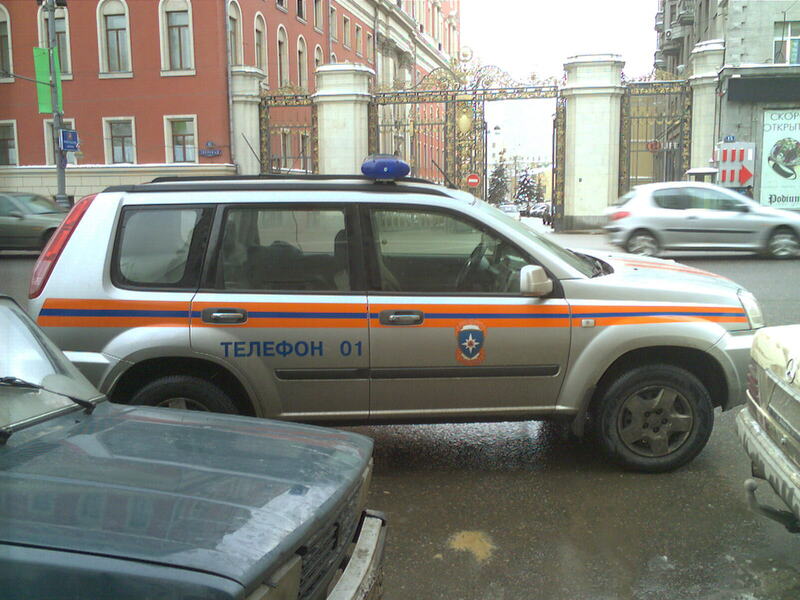 Unlike SXG75 this model is lacking Radio and built-in GPS receiver. I’d like to point out since I have the opportunity, according to user feedback, GPS receivers quality for SXG75 is very mediocre, despite claims made by brand’s loyal fans who are saying that GPS realization is perfect (all this was said before the phone was launched). EDGE is missing too. 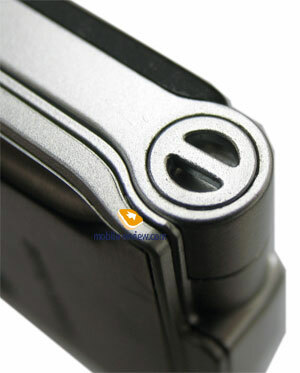 The phone advantage is case quality, materials used in it. Another advantage is qualitative internal display, which is one of the best in its class. Interface improvement was positive. 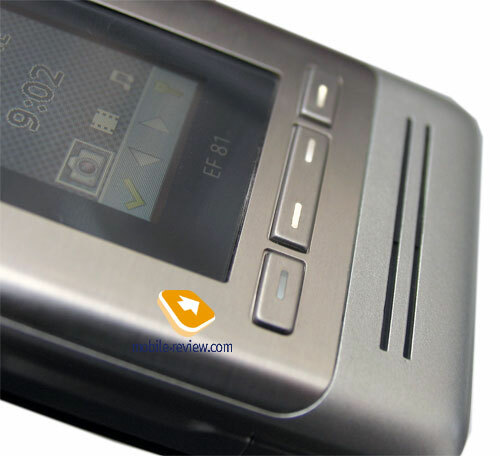 The phone is interesting as image solution for those who wanted to buy Motorola V3x, requires UMTS phone, but doesn’t like V3x’s plastic case. 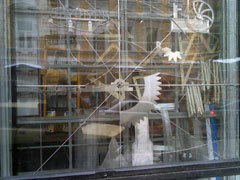 The model is replicating successful competitor and offers things that it is missing. In case you compare this phone with others on the market, average camera quality should be highlighted (although it will be okay for most users who are not seeking great camera inside handset), very mediocre realization of mp3 player, which makes its presence nominal. 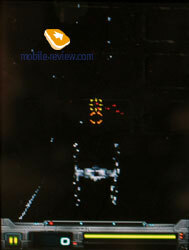 The phone turned out peculiar, in case its pricing strategy will fit Motorla V3x, it may become a hit. Unfortunately BenQ Mobile decided that the quality of used materials is enough for making the price high, and so by the moment this model will be released in April, its price will be around 450-500 USD. I shall not judge weather this is righteous price for brand known for poor performance in image line-up or no. You should see this phone in details before buying it, it will not become a bestseller since it’s “repeated” and was created as imitation of Motorola’s product. This thin coating of “hey, I’ve seen this before” over the model makes it interesting only for loyal fans of ex-Siemens brand, this is one of the last opportunities to buy pure-blooded product from the company that is now gone. I don’t see big reason to support marketologists ambitions together with disappeared brand financially, however it’s the choice that every person has to make for himself.